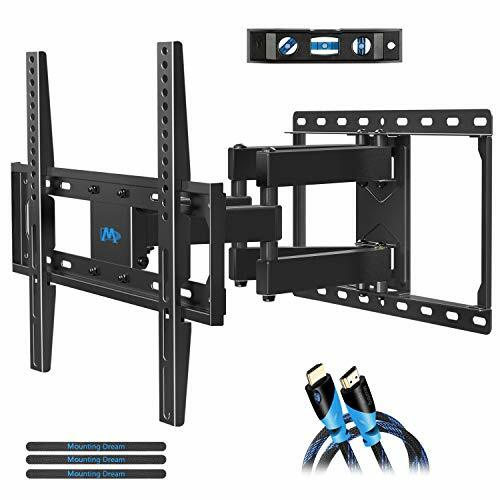 TV wall bracket fits for most of 32-55" TVs up to 99 LBS, with max VESA of 400mm x 400mm/16" x 16" mounting holes spacing. 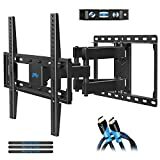 Images on left side will help you see if this TV mount perfectly fits your TV in the aspects: Like VESA, 16" studs spacing and possible blocked input. Not perfect? You can check other Mounting Dream mounts for BEST options. Easy installation with decent instruction and hardware in pre-labeled bags. +/-3° post-installation adjustment allows perfect TV leveling. Paper template makes installation of TV mounting bracket easier. Considerate Design for Allen Key Storage. Concrete anchors will be shipped if needed. Easy installation with decent instruction and hardware in pre-labeled bags. +/-3° post-installation adjustment allows perfect TV leveling. Paper template makes installation of TV mounting bracket easier. Concrete anchors will be shipped if needed. Technology of robot welding makes this TV bracket sturdy and safe.